Q.1. When the given figure is folded to form a cube then which face is opposite to the face with 2? Now, this is a peculiar type of flattened cube. However, the rules to solve the questions remain the same. Now, if you want to find the face that is opposite to the face with 2, you should consider it as the base. So, the top face (opposite face) will be the 1. Q.2. Choose a box which is similar to the box formed from the given sheet of paper. Figure A: the sheet can be folded to form a hollow cube in this particular way only if you use the following configuration given in the figure. But A is possible. Figure B: if you take the face having + on the top, then the non-adjacent blank face will be on the bottom face of the hollow cube. Then, the two adjacent blank faces will form the faces adjacent to the face having + on it, but opposite to each other in this particular scenario. Since there are absolutely no other blank faces left, figure B is not possible in given way. Figure C: This figure is very much possible with the following configuration. Figure D: From the figure given above in the diagram, we can clearly see that the two shaded faces can never be adjacent to each other in this case. So, this figure is not at all possible in any condition. Q.3. Choose a box that is similar to the box formed from the given sheet of paper. Looking at the figure given, the two square sides will form the top and bottom faces of the cube. Also, the two rectangular blank strips will form the opposite faces to each other. 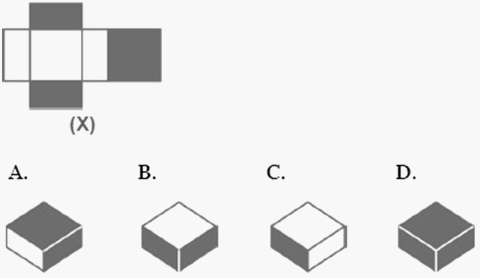 In figure B and figure D, the two filled rectangular faces have been shown adjacent to each other, so these figures are obviously not accurate. However, options A & C are completely possible. 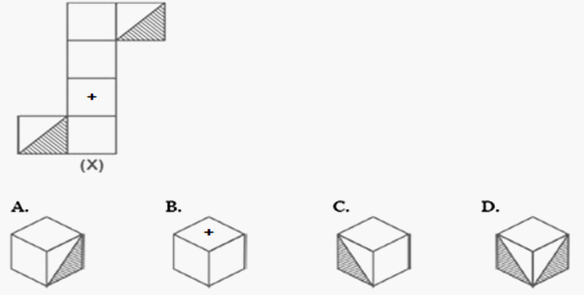 Directions for Question 4 to 10: A sheet of paper shown in the figure (X) given on the leftmost side, in each given question, is folded to form a box. Choose from amongst the alternatives (1), (2), (3) and (4), the boxes that are similar to the box that will be formed. Q.4. Choose a box that is similar to the box formed from the given sheet of paper (X). When the sheet given in the fig. (X) is folded to from a hollow cube, then one of the faces of the hollow cube formed will be of the form & this face will be exactly opposite to the face that features a square. Also, one of the blank faces is opposite to another blank face while the one more blank face is opposite to the face that features an '=' sign. Also, all the three blank faces cannot be adjacent to each other in any case. Hence, the hollow cube shown in the figure (2) that has all the three blank faces adjacent to each other is not at all possible. So, only the hollow cubes shown in the figures A, C & D are possible. Q.5. Choose a box that is not different to the box formed from the given sheet of paper (X). When the given sheet in the fig. (X) is folded to form the hollow cube, then letter '6' appears opposite letter '2', letter '5' appears to be opposite letter '3' and letter '1' appears opposite letter '4'. Hence, the hollow cube in the figure (1) that shows letter '2' adjacent to letter '6', the hollow cube in figure (3) which depicts letter '3' adjacent to number '5' and the hollow cube in the figure (4) which depicts letter '4' adjacent to letter '1' is not at all possible. Therefore, only the hollow cube in the figure (2) is possible. Q.6. Choose a box that is similar to the box formed from the given sheet of paper (X). When the given sheet in the figure (X) is folded to form a hollow cube, the K face will appear opposite to the face that features a triangle, the face that has ? will appear opposite to one of the two blank faces & to the face that bears a '÷' sign appears opposite to the other blank face given in the figure. Obviously, the cubes shown in figure (1) & figure (4) are not at all possible because they have the K face adjacent to the face that features the triangle. Although the hollow cube shown in the figure (3) has faces that will appear adjacent to each other but the hollow cube formed by folding the sheet in the given figure(X) cannot be rotated to form the fig. (3). Therefore, the hollow cube in figure (3) cannot be formed. Hence, only the hollow cube shown in the figure (2) is possible. Q.7. Choose a box that is similar to the box formed from the given sheet of paper (X). When the given sheet depicted in the figure (X) is folded to form a hollow cube, the two half-shaded faces will lie opposite to each other, the face that features a square will lie opposite to one of the two blank faces in the sheet given, and the face with a circle will lie opposite to the other blank face in the sheet. So, the hollow cubes shown in the figure (2) and figure (3) that have two half-shaded faces that are adjacent to each other, is not possible to be made by folding the sheet depicted in the figure (X). Although the hollow cube depicted in the figure (4) has faces that may appear to be adjacent to each other but the hollow cube formed by folding the given sheet in the figure (X) cannot be rotated to form the hollow cube in the figure(4). Therefore, only the hollow cube in fig.ure(1) is possible. Q8. Choose a box that is similar to the box formed from the given sheet of paper. When the given sheet in the figure (X) is folded to form a hollow cube, the face with dot lies opposite to one of shaded faces. So, the hollow cube shown in the figure (2) which has both the shaded faces that are adjacent to the face with a dot, cannot be formed in any case. Therefore, the hollow cubes shown in the figure (1), figure (2) and figure(4) can be formed. When a hollow cube is made by folding the given sheet depicted in the figure(X), then is one of the faces of hollow cube and this face will lie opposite to one of the blank faces. Also, a face that features a square will lie opposite to another blank face depicted in the figure. So, the two remaining blank faces will lie opposite to each other in the hollow cube formed. So, in the hollow cube shown in the figure (1), the face that consists of the four symbols is clearly not the same as that formed (as shown above). Therefore, the cube in the figure (1) cannot be formed in any case. Q10. Choose a box that is similar to the box formed from the given sheet of paper. When a hollow cube is made by folding the given sheet shown in the figure (X), then is one of the faces of the hollow cube and this face will lie opposite to a blank face. Also, a face that features a circle will lie opposite to the face with a dot. So, this hollow cube does not have faces as depicted in the cubes in the figure (3) and figure (4). Hence, only the cubes depicted in the figure (1) and figure (2) are possible.